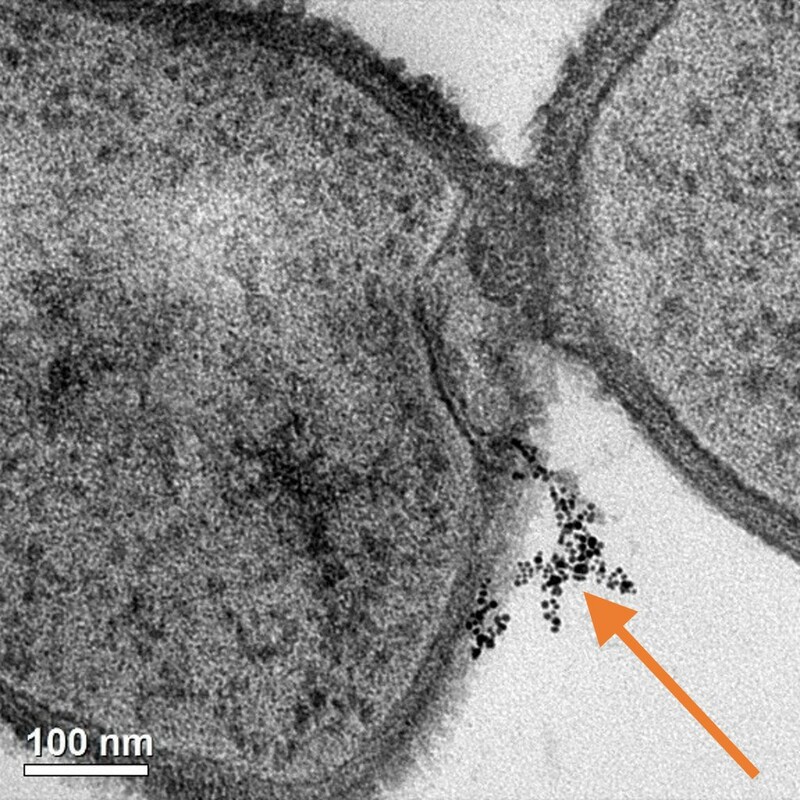 Gold nanoparticles (indicated by the arrow) binding to the surface of a Bacillus bacterium cell. Image from Feng et al., 2015,1 published by the Royal Society of Chemistry. Killing odor-inducing bacteria in stinky socks may be viewed as a heroic action for nanoparticles, but are all bacteria bad? What about those hardworking bacteria that help break down organic matter in soil to provide nutrients to plants? Since we don’t want to kill all bacteria indiscriminately, we need to be able to reduce how much nanomaterials affect beneficial bacteria when released into the environment. In order to do that, we need to understand exactly how nanoparticles interact with bacteria in the first place. Interaction between gold nanoparticles (black dots) and Shewanella bacteria. Image from Feng et al., 2015,1 published by the Royal Society of Chemistry. One big difference between Shewanella and Bacillus bacteria is that Shewanella has cell walls that feature a sandwich structure with two lipid bilayers with a polymer network between them, and Bacillus has a simpler cell wall structure with just one lipid bilayer underneath a thick layer of polymer network. When scientists study cell membranes, they use something called a “gram stain,” a dye that turns sandwich-style membranes like Shewanella’s pink, and simple membranes like Bacillus’s purple. Based on these stains, we say that Shewanella is a “gram negative” bacteria, and Bacillus is a “gram positive” bacteria. Because of this contrast, and because both bacteria are environmentally beneficial, we chose them as the representative gram negative and gram positive bacteria to test with nanoparticles in our study. A cartoon showing how we set up the experiments in this paper. The golden balls illustrate gold nanoparticles with different surface charges. 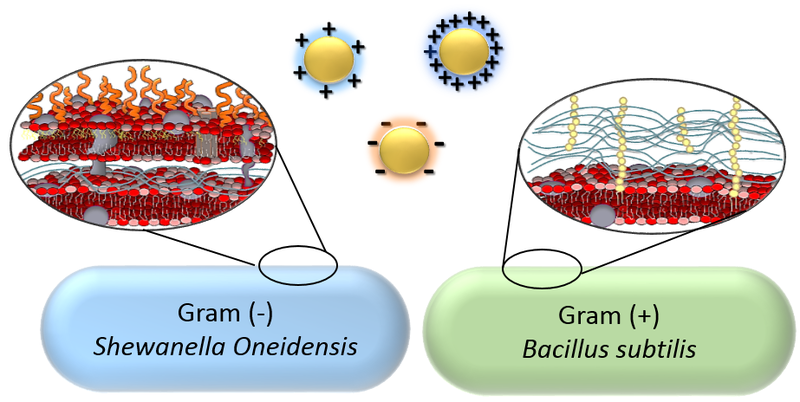 The zoomed-in structures show the different cell wall structures for gram negative bacteria (sandwich structure, left) and gram positive bacteria (simpler structure, right). Image from Feng et al., 20151, published by the Royal Society of Chemistry. Something these two types of bacteria have in common is that they both have a negative charge on their surfaces. Based on electrostatic interactions (i.e. opposites attract), we hypothesized that gold nanoparticles with a negative charge on their surface would not be attracted to bacterial cell surfaces, meaning that they would have minimal impact on whether the bacteria died. In contrast, we predicted that positively charged nanoparticles would bind strongly to cell surfaces, which could then cause cell death. Based on this hypothesis, we tested one type of gold nanoparticle with a negative surface, one with a positive surface, and one with a polymer wrapping on the surface that gave it an even higher positive charge per square nanometer. So, did our experimental results support our hypothesis? Using several techniques including transmission electron microscopy (which we wrote more about here), we found that positive and negative charges indeed governed the interactions between these nanoparticles and the cells. Even more interestingly, we not only showed that higher surface interactions led to more cell death, but we also demonstrated that the different cell surface features of the two types of bacteria led to different kinds of binding behaviors with the nanoparticles. Now that we understand a little bit more about how different bacterial cell surfaces interact with different kinds of nanoparticles, we are one step closer to figuring out how to redesign nanomaterials so that they are exactly as antibacterial as we want them to be, and no more. Note: This post was edited August 18, 2015 to replace “common cold” with “strep throat” as an example of a common bacterial infection. Common colds are caused by viruses, not bacteria!